Introduction: Clinical case report of rhinosporidiosis, a rare and chronic granulomatous disease, caused by Rhinosporidium seeberi. Objective: To include this disease in the differential diagnoses of polypoid lesions of the nasal mass. Report: A male patient from the North of Brazil evolved a three-year papilomatous polypoid lesion of the left nasal cavity. He was submitted to sinusectomy with resection of the entire lesion, located in ethmoid bulla and uncinated process. Inverted papilloma or fungal sinusitis were differential diagnoses. The histopathological examination revealed a strong infestation by numerous fungal structures with sporangia shape full of sporangiospores. The microorganisms were positive for colorations of Grocott, PAS and Mayer's Mucicarmin; opposite from Coccidioides immitis, which presents no contrast by the mucicarmin. We didn't choose complimentary treatment and after one year of follow-up he presents with no sign of recurrence. Final Comments: Rhinosporidiosis must be considered to be a nasal polypoid lesion differential diagnosis. In the intranasal lesions diagnosis we should keep in mind the patient's origin. The anatomopathological study is mandatory to set the diagnosis. In the rhinosporidiosis, the surgical exeresis can be a curative treatment. The rhinosporidiosis is a chronic and uncommon granulomatous disease, caused by Rhinosporidium seberi. It affects more commonly the nasal mucosa (70% of the cases), but it may affect the nasopharynx, conjunctiva, urethra and genitalia (1). In addition to the human beings, it's observed in other animals such as horses, bulls and fish (2,3,4). The transmission way remains uncertain, and it may be transmitted by dust inhaling and/or nasal mucosa contact with contaminated water (4,5). It's an endemic disease in some areas of Asia, mainly in the tropics (3,5). It rarely affects children, and is more common in men at the second or third decade of life (2,4). The only curative approach is the surgical excision (1,2,4). Leucodermic male patient, 48 years old, living in São Luis/MA for 5 years. He started with a left ear semi-block followed of subjective cacosmia and muco-purulent rhinorrhea with insidious evolution for 3 years. He denies unleashing factors, pathological and family histories or trips abroad. He was submitted to several treatments with antibiotics and corticosteroids without satisfactory results. Upon physical exam, the left nasal cavity was entirely obstructed by torus-shaped polyps of papillomatous aspect, pale pinkish color, elastic firm consistency and not bleeding upon manipulation. There was also mucopurulent secretion in low quantity. The computerized tomography showed the full veiling of frontal, ethmoidal, maxillary, sphenoid sinuses and nasal cavity. Inside the maxillary sinus it detected the images with osseous density and spacing of the maxillary sinus walls. We suggested a non-invasive fungal sinusitis as the first diagnostic hypothesis without leaving out the possibility of an inverted papilloma. The patient was prepared for the surgical procedures with administration of prednisone 40mg/day and amoxicillin-clavulanate 875mg every 12 h for a week. The surgery was carried out at the Otorhinolaryngology Center-BH on 01/04/2007. We used general anesthesia and intranasal access with 0o endoscope. The polyps presented a firm implantation in ethmoidal bulla and uncinate process; we didn't find allergic mucine, only purulent secretion in small amount in the maxillary and ethmoidal sinus. The sphenoid sinus presented without secretion and with mucosa in good state. The frontal sinus was opened and examined with 30o optics, and we only found mucus inside it, with well preserved mucosa. The patient remained with splint for 24 hours and the antibiotic was maintained for 10 days. He evolves with hematic crusts usual formation and good sinus reepithelization. The histopathological exam described nasal mucosa under inflammatory process, characterized by edema and infiltration of several lymphocytes, plasmocytes, neutrophils, eosinophiles and mastocytes. Stressed infestation of all mucous surface and glandular spaces by numerous fungal structure in several states of maturation with sporangia shapes full of sporangiospores. Each sporangium presented a birefringent membrane and measured about 10 to 180 micrometers of diameter, containing sporangiospores of about 2 to 5 micrometers of diameter. The microorganisms were positive for the colorations of Grocott (Picture 1), PAS (Picture 3) and Mayer's Mucicarmin (Picture 2). Such description is compatible with Rinosporidium Seberi. We observed tissue necrosis focal areas associated to the presence of sporangia in the submucosa and focal area suggestive of vascular invasion, characterized by sporangiospores at the vein light without fungal structures in the vascular wall thickness. Picture 1. 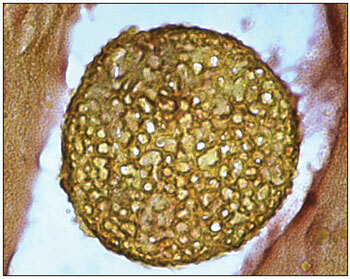 Grocott 1000 X - Histopathological cut showing sporangium. Grocott coloration. Increase 1000x. Picture 2. 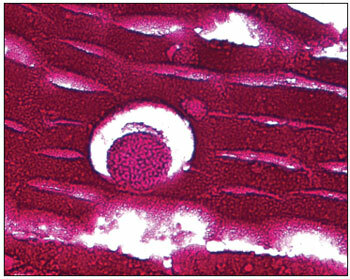 Mayer's Mucicarmin 1000 X - Histopathological cut showing sporangium. Mucicarmin coloration. Increase 1000x. Picture 3. PAS 100 X - Histopathological cut showing sporangium. PAS coloration. Increase 100x. We chose to follow-up without complimentary treatment and 1 year after the procedure, we didn't detect signs of recurrence. Some microbiologists consider the Rinosporidium Seeberi to be a fungus and others to be a procarionte cyanobacterium (Microcistis aerugonisa) (3,5). The disease is characterized by the presence of pseudotumoral lesions of the mucosa with polypoid, papillomatous or verrucous aspect. It's friable, bloody to the touch, painless and the septum implantation is the most common form. He remains with complaints of nasal obstruction, epistaxis, mucopurulent rhinorrhea. In immunodepressed it may cause death (1,2,3,4). The diagnosis is rarely made clinically and it's often confused with soft parts sarcoma. 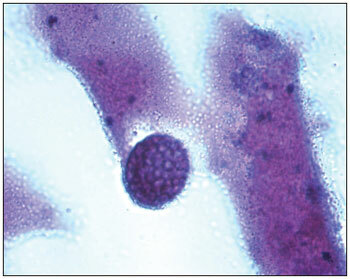 The fine-needle aspiration biopsy (FNAB), through the lesion histopathological and cytological study, set the diagnosis. The cytological criteria include the presence of endospores of 5 to 10 µm and sporangium of 50 to 1000 µm, which help easily differ from other microorganisms such as nasal fungi. The use of colorants such as PAS, HE, Grocott, Mayers' Mucicarmin and GMS help in the diagnosis (3,5). The therapeutic approach is a theme under discussion. It's a consensus that the surgical resection must be the main treatment with total resection of the lesion and cauterization of its peduncle, and bleeding is its main postoperative complication. The great doubt is about the time for follow-up of such patients. There are no antifungals or antimicrobials that interfere with the prognosis, but we suggest the prolonged use of Dapsone (100 mg/day for several months) may help prevent the disease recurrences (1,2,4). The rhinosporidiosis must be taken as a differential diagnosis of the nasal polypoid lesions. The intranasal lesions must always be evaluated with details, by making a critical anamnesis and always considering the patient's origin. The anatomopathological study is mandatory to define the diagnosis. In the rhinosporidiosis, the surgical exeresis may be curative, the postoperative follow-up must be made on a long-term basis for the risk of recurrences. 1. Raveenthiran V. Metastatic rhinosporidioma in a child. J Pediatr Surg. 2006, 41(4):853-5. 2. Dada MS, Ismael M, Neves V, Branco Neves J. Presentación de dos casos de rinosporidiosis nasal. Acta Otorrinolaringol Esp. 2002, 53:611- 614. 3. Hussein MR, Rashad UM. Rhinosporidiosis in Egypt: a case report and review of literature. Mycopathologia. 2005, 159(2):205-7. 4. Franca GV Jr, Gomes CC, Sakano E, Altemani AM, Shimizu LT. Nasal rhinosporidiosis in children. J Pediatr (Rio J). 1994, 70(5):299-301. 5. Morelli L, Polce M, Piscioli F, Del Nonno F, Covello R, Brenna A, Cione A, Licci S. Human nasal rhinosporidiosis: an Italian case report. Diagn Pathol. 2006, 31(1):25. 1. Doctor's degree. Head of Medical Residence of the HC UFMG. 2. Assistant Professor of the Ophthalmology, Otorhinolaryngology and Phonoaudiology Department of the Federal University of Minas Gerais. Service Head. 3. Medical Residence. Resident of the Otorhinolaryngology Center BH. 4. In course for Doctoral Degree in the General Surgery Department at the Federal University of Minas Gerais. Doctor at the HC UFMG. 5. Assistant Professor of the Ophthalmology, Otorhinolaryngology and Phonoaudiology Department of the Federal University of Minas Gerais. 6. Free Professor of the Ophthalmology, Otorhinolaryngology and Phonoaudiology Department of the Federal University of Minas Gerais. Institution: Universidade Federal de Minas Gerais. Belo Horizonte / MG - Brazil. Article received on December 16 2007. Approved on August 23 2008.